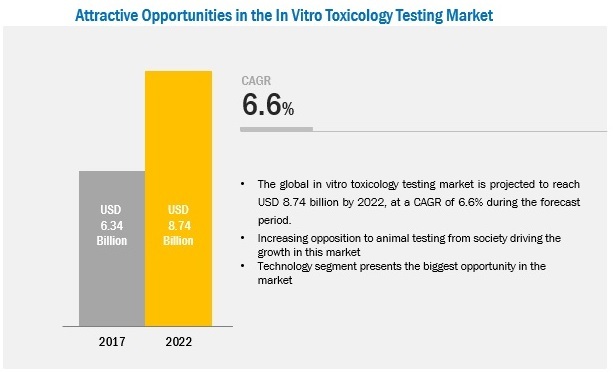 [253 Pages Report] The in-vitro toxicology testing market was valued at USD 5.99 Billion in 2016 and is expected to grow at a CAGR of 6.6% during the forecast period to reach to USD 8.74 Billion by 2022. The In vitro toxicology testing market includes safety assessment of chemicals, drugs, cosmetic products, food additives, etc, without using animals as test models. This testing is performed on advance cell and tissue models to determine safety by studying the potential of the test substances to cause toxicity, such as genotoxicity, skin irritation and sensitization, cytotoxicity, ocular toxicity, organ toxicity, phototoxicity, dermal toxicity, and other toxicities. The opposition to animal testing, increasing R&D at early stages of drug development, innovation in cell culture technology are factors driving the growth of the global market. The base year considered for this report is 2016, while 2017 is the estimate year. The major players in the global in vitro toxicology testing market are Cyprotex (An Evotec AG subsidiary, Germany), Covance (A Laboratory Corporations of America Holding’s subsidiary, US), Eurofins Scientific SE (Luxembourg), GE Healthcare (US), Thermo Fisher Scientific (US), SGS SA (Switzerland), Promega Corporation (US), Merck KGaA (Germany), Charles River Laboratories, Inc. (US), and Lonza Group Ltd. (Switzerland), etc. 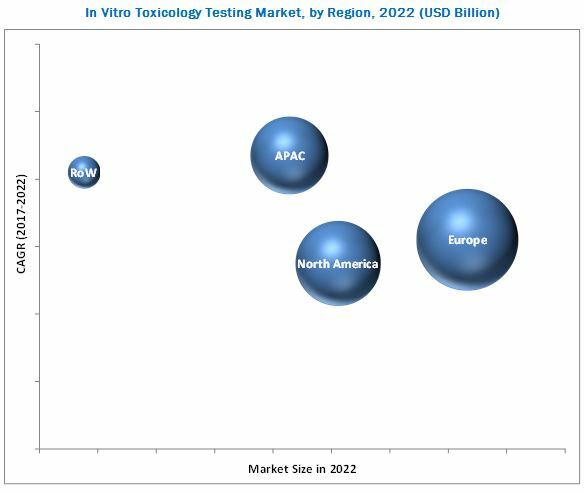 The In vitro toxicology testing market is projected to reach USD 8.74 Billion by 2022 from USD 6.34 Billion in 2017, at a CAGR of 6.6%. The key factors driving the growth of this market include opposition to animal testing, growing demand for in vitro technology in the European market, new and promising technologies, and increasing R&D expenditure to detect toxicity at an early stage. The report analyzes the global market by products & services, toxicity endpoints and tests, technology, industry, methods, and region. Based on toxicity endpoints and tests of in vitro toxicology testing, the market is subsegmented into ADME, genotoxicity, skin irritation and sensitization, cytotoxicity, ocular toxicity, organ toxicity, phototoxicity, dermal toxicity, and other toxicities (eco toxicity, endocrine disruption, and reproductive & developmental toxicity). In 2017, the ADME segment is expected to account for the largest share of the global in vitro toxicology testing market owing to its highly reproducible & accurate data and the increasing demand to curb drug toxicity at the drug development phase. Based on industry, the global market is segmented into pharmaceuticals and biopharmaceuticals, cosmetics & household products, food, and chemicals. In 2017, the pharmaceutical and biopharmaceutical industry segment is expected to account for the largest share of the global market. The new research initiatives, mandatory preclinical safety evaluation of molecules, and growing R&D for detecting toxicity in the early stages of drug development are the primary growth drivers for this industry segment. 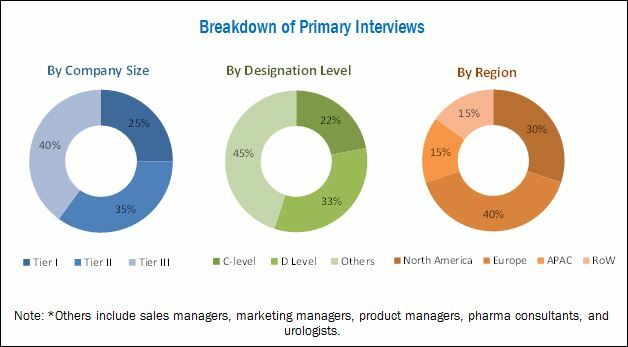 Based on region, the in vitro toxicology testing market is segmented into Europe, North America, Asia Pacific, and the RoW. In 2017, Europe is projected to account for the largest share of the global market. The demand for in vitro toxicology testing in Europe is driven by the increasing number of investments in research and innovation by the European Commission to develop alternative methods to animal testing. The European Union has been a leader in supporting research to advance the development and validation of in vitro toxicology testing protocols for regulatory purposes. However, the reluctance of regulatory bodies to consider in vitro test results over in vivo and failure to produce comparable results from in vitro testing to that with in vivo testing are factors that may hinder the growth of this market. In 2017, Thermo Fisher Scientific, Inc. (US) is expected to dominate the in vitro toxicology testing market. Some of the other players competing in this market are Cyprotex (An Evotec AG subsidiary, Germany), Covance (A Laboratory Corporations of America Holding’s subsidiary, US), Eurofins Scientific SE (Luxembourg), GE Healthcare (US), SGS SA (Switzerland), Promega Corporation (US), Merck KGaA (Germany), Charles River Laboratories, Inc. (US), and Lonza Group Ltd. (Switzerland), etc. 14.9 Charles River Laboratories International, Inc.